The Villa Musica Summer Orchestra, now in its 7th year, is made up of a community of musicians aged between 13 and 75, who come together to make music. Delighting in their diversity, the participants in this program represent every possible musical “type”, from high-level amateur players through to professionals. Each participant shares a passion for orchestral music and is especially inspired to gather together each summer to share this commonality. Each year, word spreads about the program – the camaraderie, the joy, the wonderful repertoire – and the program grows. This year will be no exception. Each summer, the orchestra prepares two programs; each with a 5/6 week rehearsal period. All players are auditioned if it is their first time with the program, and are required to be available for all rehearsals and the concert. Concerts in the middle of July and late August are FREE to the public and historically have been held at the new San Diego Public Library, Downtown. 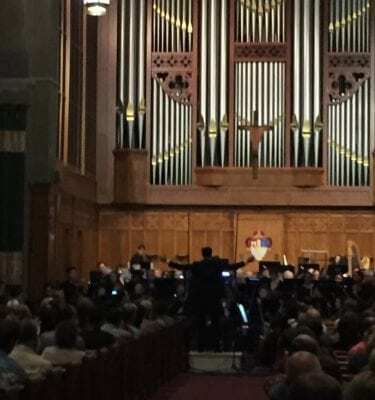 Last year both concerts attracted over 750 audience members; made up of friends and family of the musicians, children and adults affiliated with Villa Musica and/or the library and members of the homeless population who live in the East Village. This year the VMSO program will offer two programs: Session I Wind Ensemble conducted by William Gilmer and Session II Full Orchestra conducted by James Beauton. For details about repertoire and to register for either or both of the 2019 sessions please click below.